Co Limerick dairy farmer Ned Frost. Ned was one of the early adopters of Panatec Rumen Proof, a residue-free feed additive manufactured by Mayo Healthcare which acts as a rumen enhancer for greater performance and improved energy in the rumen. He started including it with the ration three years ago, giving it to cows with their morning in-parlour feed. In those three years, Ned says Panatec Rumen Proof has helped him lift fertility and overall cow health. “We inseminated 170 cows last year and we only had nine that were not in calf,’’ he reports. Ned and his wife, Tina, farm 150 acres at Islandea, near Adare, Co Limerick and own a further 75ac of offlying land. They also rent a further 50ac. The herd is on a total mixed ration (TMR) with silage, but with increasing concentrate costs Ned looked at other options. As the protein element of feed was most costly, the decision to feed fresh-cut grass during the grazing season was made. “The crop we can grow well in Limerick is grass, and as it’s naturally high in protein we could maximise the use of what we can grow well,” says Ned. Substituting silage with fresh grass between spring and autumn exploits the protein content of the sward. As well as the TMR the cows receive an 18% protein nut in the parlour with a scoop of Panatec Rumen Proof added. 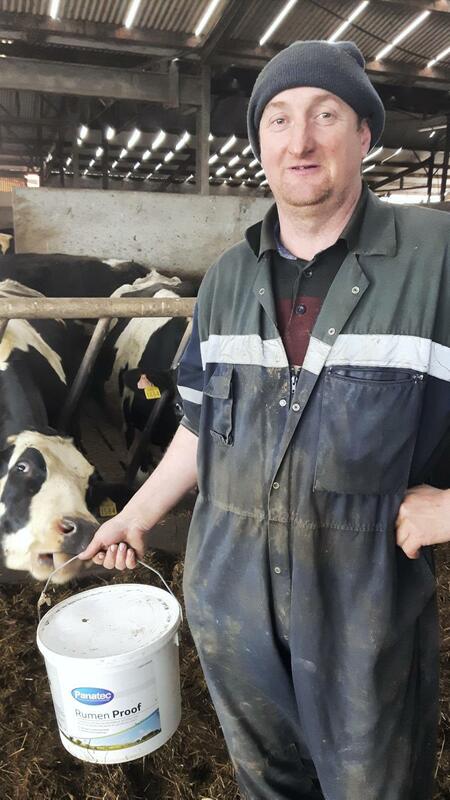 For the last three years Ned has fed Panatec Rumen Proof from calving until June but now, with the advent of a nut incorporating the product, he plans to feed it throughout the year. The herd calves from mid-January to mid-April but the calving period with be tightened going forward. The herd’s annual milk yield average is currently 7,500 litres at 4.10% butterfat and 3.40% protein. As well as excellent fertility, Ned says there has been an improvement in general herd health since he was introduced to Panatec Rumen Proof on the recommendation from another dairy farmer. “In previous years we might have had as many as four or five displaced abomasums but now it is just one or two. We get very few cows with stomach problems,’’ he says.